IDF's nation-wide TB programme has been recognised by the StopTB Partnership. 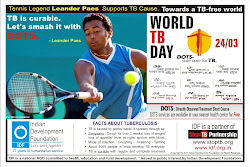 A 13-page June 2009 newsletter of StopTB Partnership highlights the work of IDF in TB awareness programme in India. Click the newsletter link given below. Please see page No.6. Extract of news is given below. IDF is a proud partner of StopTB Partnership. In the quiet lanes of Wadala is hidden a little-visited institution that’s almost a mirror to the attitude Indian society has had to leprosy, through the ages, the Acworth Leprosy Museum housed in one of the wards of the Acworth Municipal Hospital for Leprosy. A joint venture of the Acworth Municipal Hospital and the Acworth Leprosy Hospital Research Society, substantially supported by The Sasakawa Memorial Health Foundation and The Nippon Foundation, Japan, the museum offers a thought-provoking display of photographs and documents. Prathiba Kathe, the project coordinator at the museum, says: “Our aim is to inform the public about a disease that is still a serious problem in our country.” The museum is open for public viewing on weekdays between 9 in the morning and 3.30 pm. The IB (International Baccalareaute) students of Podar International School, Santacruz under their CAS programme (Creativity, Action and Service) are in absolute partnership with Indian Development Foundation (IDF) for their social service activities. CAS Co-ordinator Mrs. Sarala Gavane led a batch of 41 students to Vimala Dermatological Centre, a leprosy/ TB project of IDF in North Mumbai in the early hours of Saturday (June 27). The IB Diploma Programme students have to undergo about 150 hours of social work in a year as per their curriculum and it is our privilege to have continued patronage of IDF for CAS programme. The students were curious to know about leprosy and it was a new experience for them to visit a leprosy home for the first time, Mrs. Sarala Gavane added. Dr. Narayan B. Iyer, National Co-ordinator of IDF inaugurated the programme by giving brief details of the workings of the Foundation followed by a scientific presentation on leprosy. A film on leprosy helped the students to clear their doubts on the disease. Leprosy is not hereditary, as a child borne to a leprosy patient may not have leprosy at the time of birth, Dr. Iyer said. To a query raised by one of the student whether leprosy is contagious, Dr. Iyer clarified by citing the example of the dedicated sisters and doctors treating the patients and a host of NGOs working for leprosy patients who are free from the disease. Dr. Iyer said leprosy is completely curable and treatment is given free of cost across the country. He also said that India has achieved leprosy elimination status and NGOs are now working on rehabilitation of patients. The students made two groups and went round the male, female and children wards of Vimala Centre and they also had an insight of the out-patient-department where scores of people visit regularly and get treated. The students felt happy as they went around each ward interacting freely with the patients and greeted them with a smile. "We could see the glimpse of happiness on the faces of each patient as we enquired about their well-being", Podar students, Ahmed, Sourabh and Harmit Singh, expressed. "It is a day of fulfillment for all of us and we feel proud to be a part of IDF. 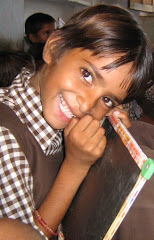 Through CAS programmes we will do our best to bring smile among the underprivileged" said Zeba, Anishka and Riddhi. Dr. Sharad Nayampally and Mr. Sanjay S. Waghmare from IDF made arrangements for the programme. We use the word hospitality, service and charity several times in our talks. But we realised the actual depth and colour of these words the moment we visited Vimala Centre located in North Mumbai. 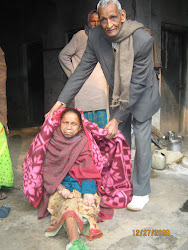 The Sisters care for the leprosy patients cannot be simply explained in words. It's remarkable indeed to witness the depth of compassion. The feeeling for the inmates is immeasurable and the love is seen all around. The maintenance and upkeep of the centre is awesome. The atmosphere of the hospital is very serene, calm and blessed. One would guess if such a place exists in Mumbai. We were welcomed by a sister and were explained about the various activities. The recreation hall, the living rooms of the inmates are maintained so well that the patients feel at home. We were really moved by the stories of a few children and also that of a couple of inmates. The tailoring unit in the centre is an excellent inhouse rehabilitation activity which helps them towards self-reliance. We have no apt words to describe the services and the charity which Vimala Center is offering to the society. We are indeed happy and also feel proud to be part of Indian Development Foundation which networks with similar projects across India. Rakhul V. and Aalok Shinde, students of ICFAI Business School, Mumbai. Mr. Sai Prem kumar, IDF Ambassador presenting IDF Performance Report to Rev. 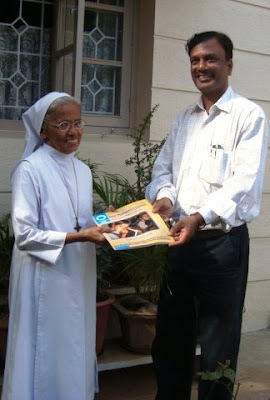 Sr. Louis of Mariam Nivas Higher Primary School, Bangalore. Rev. Sr. Louis taught him 30 years back in the same school. Rejoicing reminiscences. 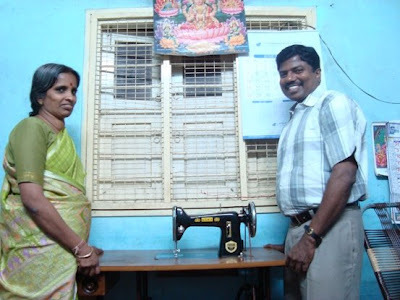 Dr. S. Franklin presenting a tailoring machine to Ms. Ranganayagi as part of IDF rehabilitation programme. 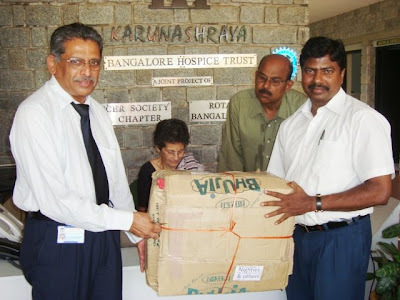 Dr. S. Franklin presenting dress materials to Dr. Sadanand, Medical Officer of Karunashraya in Bangalore. 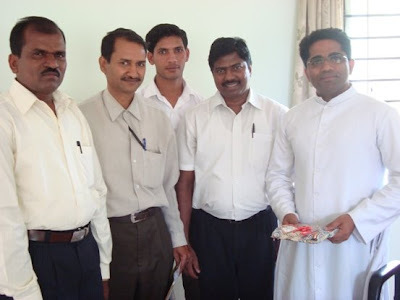 IDF Karnataka Team presenting a memento to Rev. Fr. Joseph Thoompanal of Sumanahalli Leprosy Project, Bangalore. IDF Karnataka Team presenting Joint Action magazine to Rev. Fr. George Kannanthanum, Director, Summanahalli Leprosy Project, Bangalore. Asian Trading Corporation (Book Stall) patronizes IDF by placing a donation box. Mr. L.E. Denises, Sales Co-ordinator joins Mr. Samuel Vincent, Development Executive of IDF for a group photo. "According to recent data from the World Health Organisation, diabetes accounts for 14.8% of pulmonary tuberculosis and 20.2% of smear positive tuberculosis. If this continues, diabetes could replace HIV-AIDS as the main reason for TB coming back into society. It could prove highly infectious, as is the case with swine flu today," said Dr Vijay Viswanathan, Managing Director, M V Hospital for Diabetes and Diabetes Research Centre. Patients with active TB and type II diabetes mellitus are likely to have multi-drug resistant TB, he added. Mr. Rajendra Pandit, Director, Raval International School, Mira Road, Dist. Thane supports IDF's health, education and rural development programme. 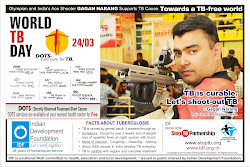 IDF carried out TB awareness programme in the school. The students of Raval International School participated the health awareness programme and resource mobilisation drive. IDF thank Raval International School team for their kind and continued support. The Navhind Times, Goa carried the article of Dr.Narayan B. Iyer on the World Environment Day. Mother Nature Needs us like promising to plant a tree on every birthday can do a lot in environmental protection. How many billion trees can be planted every year if every individual takes up the responsibility? IDF thank The Navhind Times for their excellent support. Giri Trading Agency Pvt. Ltd is a great supporter of Indian Development Foundation. Dr. ARK Pillai, President, IDF and Dr. Narayan Iyer thanked Giri Trading for the continues CSR programmes carried out by the Agency supporting IDF projects. Mrs. Sharada Prakash, Director, Giri Trading Agency Pvt. Ltd. visited IDF office to get an update on IDF's upcoming activities. She congratulated IDF for the wonderful humanitarian programmes carried out across the nation. Being World Environment Day (June 5), Mr. Hari Thampy and Mrs. Sharada Prakash discussed on various methods on promoting green products to save the planet earth. We need to sensitize people on the importance on the growing environmental hazards and it's time that every individual takes up the responsibility, said Mrs. Sharada Prakash. Mr. Hari Thampy, IDF Ambassador and an upcoming entrepreneur has novel ideas of promoting green products in market. He congratulated Giri Trading Team for already promoting such green products for nearly two decades now. IDF takes part in various environmental awareness programmes and cleanliness drives and we can certainly help the team in promoting green products to IDF contacts, said Dr. Pillai. The theme for this year's World Environment Day is `Your Planet Needs You'. For story of Giri Trading Agency Pvt. 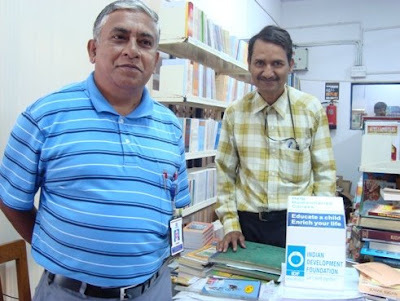 Ltd.
See & Recruit Private Ltd., Mumbai has found a novel method of providing volunteers to various NGOs in Mumbai for supporting different human causes. S&R will make a study of NGOs and draw volunteers from various colleges in Mumbai to suit their needs. It's a part of the Corporate Social Responsibility of S&R to provide free human resource for social programmes. Mr. Tushar Rathod, Chief Executive, S&R and Dr. A.R.K. Pillai, President, Indian Development Foundation signed an MoU in the line of mutual co-operation to meet the needs of the society. Youth in these days are waiting for an opportunity to serve the society and networking with NGOs will certainly help in realising their dream, said Mr. Tushar. Dr. Pillai andDr. Narayan from IDF congratulated S&R team for the novel initiative of drawing human resource for social programmes. It's an excellent CSR activity and this will be welcomed by many. S&R can be a catalyst in providing volunteers to various NGOs to make an effective working of the project. More youth will get aware of the social programmes and they inturn will participate in the development of the society, said Dr. Narayan. Ms. Hita Shah, MBA student from IES, Bandra, Mumbai and an intern at S&R helped in co-ordinating IDF & S&R for a meaningful social tie-up. Educate a child...Enrich your life !! Academic Year 2009-10 begins from 1st week of June. Providing education to the underprivileged children through IDF's empowerment programmes/ classes and also sponsoring education for children of leprosy affected persons are on the prime agenda of IDF. Sponsorship of a child in rural set-up works out to Rs.4000/= per annum. IDF Sponsorship includes tuition fees, two uniform sets, books, and a mid-day meal. There are a lot of other facilities that are given to the children. We also have specific sponsorship where students in urban areas are sponsored which includes only fees. Here is an opportunity to support health, education or development programmes of IDF. For those who missed to sponsor a child, here is a golden opportunity. Don’t miss it again !! Those desirous to sponsor a child may send their donations in favour of Indian Development Foundation and mail it to L 10/ 3 & 4 Jal Ratan Deep, Bangur Nagar, Goregaon (W), Mumbai 400 104.